Sam has sent us an in-depth guide to the best Fantasy draftees for us to consider this pre-season. Download the pdf. With Fantasy opening very soon, this Draftee guide from Sam provides a VERY handy resource as you try to fill your bench spots with cheapies and aim to find the best of the young crop for 2016. 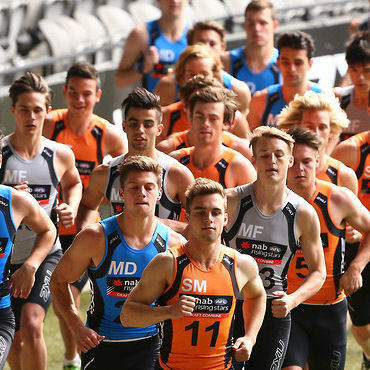 24 draftee and 3 second chance saloon profiles. TAC Cup and U18 Championships statistics & Fantasy numbers. Click here to download the 2016 Fantasy Draftee Guide pdf (2.4mb). Big thanks to Sam for this. Don’t miss Jeppa’s Juniors guide coming later in the pre-season. Brilliant work Sam. Thanks for putting in the tough long hours to get this piece done. RE: Cavka, this was sent before the news of his retirement. Shame, poor kid. Could have had a great career (and been a very nice fantasy option). Fingers crossed he is successful in whatever he chooses to pursue post-footy. Seemed like a great kid with a very bright career. Would have been the perfect inside midfielder, and a fantasy gun for our teams. HUGE effort there Jeppa. No need to apologize either! Great work! Keays played 6 NEAFL league games for Brisbane last season, too. Averaged 78 with scores of 58, 78, 58, 105, 101 and 69. No time on ground info, so I don’t know if the lower scores resulted from lower TOG. McGuinness averaged 79 from 11 games with Brisbane’s NEAFL league team. Sam here, Gollo is my DT Talk account username. Appreciate that info, I didn’t have any NEAFL stats resources to use from, so that info is very handy. Thanks! NEAFL and SANFL stats are released in pdf format game by game. Absolute pain in the arse. I don’t have the patience to compile all of the data, so I targeted particular players…McGuinness and Keays are a couple of them. Haha, yes I know all about the SANFL stat recording system; I tried to compile them like the TAC Cup and U18 Champs stats but too many rounds had already passed, and the three different formats (state, reserves, U18) can be a pain in the arse. I have 5/8 locks and near locks! I have a good feeling about this year. Nice one – should be a great reference throughout the season. kennedy or freeman and why? “Thanks for sharing this, Sam – you’ve clearly put a lot of time into it and I really appreciate the effort. If you give me your opinion, backed up by data, I’ll give you mine. Supposing you are talking about Matt Kennedy, then Kennedy by a long way, as long as he is named for round 1. Matt Kennedy is a versatile inside ball-winner/medium forward who showed his Fantasy scoring potential in 2015, despite suffering injuries mid-year. He has some terrific skill and athletic attributes and is a very well-rounded player, statistically. He has an imposing frame (187cm, 84kg) and is an archetypal modern midfielder. The only possible downside towards Kennedy is his lack of experience in an AFL environment, considering he was a 2015 draftee. Nathan Freeman is not someone who I would advise picking up, not until he proves himself. This is for a few reasons. First of all, his injury record is not at all confidence-boosting and is something that should be in the back of any coach’s mind who decides to take a punt on him. The number and severity of soft-tissue injuries he has managed to pick up is quite astonishing and for this reason, unfortunately, I can’t see him having a very fruitful AFL career. Secondly, he is not a high Fantasy scorer. His stats in his draft year aren’t terrific, as he is very much an impact player with explosive pace and good skills. I doubt, even with a clean injury run, he will be able to average much more than 85 at the peak of his powers. Finally, I do have doubts over his playing security in the St Kilda team. Freeman’s addition doesn’t exactly fill a hole in the Saints lineup and with guys like Gresham and O’Kearney impressing on the track, you may wonder whether he’ll be managed throughout the season. I certainly do. That is a lovely comparison, thanks Sam. Really no point in giving my opinion now (especially as I was waiting on Lochie to provide his), since it’s the same as yours but would be much less detailed and informative! Yep, I read that Q&A question and it’s a footnote in my preview of Jade Gresham. Sounds promising! This is a thing of beauty for this early on. This is a great tool Sam. Thanks for the time spent on putting it together. With the different pricing structure in RDT would you move Hopper into the “lock” category? Would it change your comments dramatically looking solely from RDT perspective? even with Essendon’s debacle, I’m still concerned that Parish may not yet have the body to withstand the rigours of being an AFL midfielder. Will certainly be a great player after a few more pre-seasons. Yes, and this is something which I have constantly pondered during his draft year when many others were rambling on about his inside, contested exploits which I can see him doing early in his career. I still have big doubts and I’d stay way in RDT too, but he’s more suited for that game type rather than AFL Fantasy. Great work Sam. This will definitely be a great aid in both AFL Fantasy and keeper draft leagues. Magnificent work Sam! Really really impressive. One I thought may have got a gig was Cunningham? Blues need speed and class I think the lad has both. What are you thoughts on the lad? Would think almost a lock for Rd 1 as bolts is a big fan. Cuningham…not enough ns in his name so he can’t be trusted. I’m not Sam, but I’ll have a crack at answering your question. Cuningham might play early in the season and he could turn in to a good player for the Blues, but at this stage of his career he doesn’t have a fantasy friendly game. He just doesn’t get enough touches and, typical of outside players, he doesn’t make up for it through manic tackling. If you think his JS is so solid he can’t be ignored make sure he’s on your bench and not on your field. Great stuff Sam! Lovely stuff. As I said above, I’m not Sam…but I’m happy to tackle your list. Francis: ummm…I’ll leave this one to Gollo. I’ve read his opinion of Francis on another site and…well, he knows a lot more about the topic than me, so I’ll let him tell you what he thinks. Yarran: currently in rehab group and seems unlikely for round 1. Probably a good chance to play when he’s fit – let’s face it, you don’t draft a 26 year old unless you plan for them to play at senior level. Averaged 65 from 19 WAFL games last year so there might be better options. Could present an in-season downgrade option to sit on your bench, but I wouldn’t expect too much from him. Weller: averaged 95 from 4 TAC Cup games in 2014 and 68 from 18 WAFL games last season. I don’t mind him, but I think there might be better options. Monitor NAB. Byrne: byrning up the track I’ve heard! I like him. I liked him last preseason too, but then he got injured. Monitor through NAB. Gore: averaged 92 from 11 VFL games last year (had some injury issues). I like him, but does he get a game with the Crows? He’s on the fringe of their best 22, so monitor through NAB and wait for round 1 teams. All right, thanks for asking this question, because I’ve got some strong opinions on some of these players. NIck Kommer: I feel there’s an unpredictability to Kommer’s potential fantasy worth. It seems all people, at this point in time, are locking him in for early games and FWD eligibility. I don’t actually think he’s a lock for good gametime at all. I’m not sure if he’s still recovering from injury at the moment but he hasn’t played AFL footy since 2014 so that has to worry some. Wait until NAB Challenge to see how he shapes up, but even still, as a defensive forward scoring is not his strong suit. Stats from bluenosers proves that. Aaron Francis: I advise coaches to stay away from Aaron Francis. Over at the BigFooty Fantasy forums everyone seems to all over Francis, but I can tell you that he is not a good Fantasy scorer, and won’t be unless he develops his ball-winning and versatility. His U18 Champs were terrific, but inconsistent, and while he averaged 75 over this period it was mainly due to being upped by one anomaly score of 140. His SANFL stats were unimpressive and for someone as highly priced as him, you’d need a lot more output to be able to pick him worry-freely. Shane Yarran: Shane Yarran, if he wasn’t injured, would be the locked F8 in nearly every Fantasy team at this point in time, and for good reason. He is a goalsneak, plain and simply, and while he doesn’t win much of the ball, on a good day he’ll bag 5 with a bunch of tackles and give you some easy, valuable bench security. Should he recover from injury in due time, his job security should be very good, considering there’s no reason to draft someone like Yarran if he wasn’t going to play. I like him a lot, however be up to date with injury news because it could be worse that I think. Lachie Weller: The only question I have with Weller is still, whether he gets solid gametime. He has the point-scoring ability to do well Fantasy-wise when he does play, but competition is hot for Freo selection and many youngsters will have to do with rest games every so often. Even still, looking at the stats bluenosers provides you can see the he knows how to rack up decent scores, but don’t be expecting any mammoth games in 2016, as he is quite skinny and in that ‘next rung’ of Fantasy prospects from the 2014 draft. Ciaran Byrne: I don’t have much info on Byrne but if he can settle into a nice rebounding role for the Blues in 2016 he could provide some good sneaky point. One to watch in the NAB, I don’t know much about him right now. Dean Gore: I like Dean Gore as an RDT pick, as long as he looks set for games. In AFL Fantasy I feel there are other players who might provide more reward than Gore, however his consistency is something to admire for RDT. What I find compelling about Gore is that there is always one facet of his game which will step up if another facet is low. For example, he might only get 15 possessions in one hard-fought match, but you know that despite this he still recorded 10 tackles. If tackles and marks are low, he still got 25 disposals playing on the outside. His VFL season in 2015 fills me with a lot of hope, and him being a SA boy playing for Adelaide, I have a good feeling about his playing and scoring prospects. At the U18 Champs in 2014, he averaged 77.17, which put him in the top rung of those players, and his grit and determination in game very good. Of those, I like the look of the Yarran, Weller and Gore picks the most, so long as they look set for gametime. Byrne is a big one for the NAB Challenge watchlist. I’d be staying clear from Francis and Kommer unless their scoring prospects improve dramatically. Brilliant Sam, thanks for taking the time to do this. And you bluenosers, much appreciated. Did the link not work for anyone else? You have to download the PDF from the link, other than that I’m not much help, sorry. Sorry mate, I wouldn’t know what to do. Weitering (1), Schache (2), Francis (6), Hipwood (14)and Himmelberg (16). Weitering: An absolute jet of a footballer and a bloke. Will 100% be captain of Carlton one day. As a purely KPP player, the only thing he really brings to the table for Fantasy is his marking. Ball-winning, tackling and cheap-won footy are not his strengths, and he is way too pricey to be picked in 2016. There is the miniscule chance that he could break out to become a solid Fantasy scorer, but don’t count on it. Schache: Marking KPF who doesn’t really roam up-field, doesn’t win lots of the ball and won’t be assisting many scores. Don’t even consider. Francis: Read above reply on Francis. Hipwood: Hipwood has solid talent but like so many players similar to him, won’t make the grade, IMHO. He is too skinny to be a lock-down KPD or Full-Forward at the moment, and I doubt he will put on much weight. He’s never really been a ruckman, despite being 200cm tall, and doesn’t tackle, win the ball or score to much proficiency. If you’re picking him, you’re expecting many scores of 50 or less. ‘Nuff said. Himmelberg: Himmelberg is intriguing. He’s a purely medium forward player who has some exciting ability, but only really came into his own toward the back end of 2015. As a result, I haven’t seen a heap of footage on him, but the signs look good. There is a chance he becomes Fantasy-relevant if he can develop some sort of midfield game, but I doubt he has the athleticism to do that. He reminds me of a stronger Jack Gunston, and not as mobile. We’ve seen Gunston break out as a Fantasy player, and while he’s not someone to pick in 2016, Himmelberg could be a nice POD in a few years’ time. Thanks Sam. I wouldn’t think of picking them in salary cap footy but needed to know for draft leagues (UF) I’m in. It’s Sam here, by the way, Gollo is my username. Outstanding article Sam. Great stuff. Very, very helpful. Great analysis, thankyou, much food for thought. The question I’m pondering is are first year 18yo draftees AF relevant anymore? Looking at last season, the rookies that proved most valuable were D6 Oxley, D7 McIntosh, D8 Saad, M7 Cripps, M8 Vandenberg, M9 Lambert, M10 Ellis-Yolmen, R3 Nankervis, R4 Brooksby F5 Hogan, F6 Armfield, F7 McCarthy and F8 McInnes. NONE of these were 18yo draftees. (You could mount a case for Jack Lonie at F8.) Are young draftees just too overpriced in AF? To be honest, you may have a point, but last year the Fantasy prospects of many of the draftees were minimal compared to this year. And of the one’s that could have gone big for Fantasy, many were nullified in some way: Isaac Heeney, Christian Petracca, Angus Brayshaw, Jack Steele etc. In the 2015 draft crop there is a much wider range of capable AFL Fantasy, RDT and SuperCoach players, with the very best able to become legitamate Fantasy pigs (Gresham, Lovell, Keays). Last year, I do think the first-years were way too overpriced, but the system AFL Fantasy have introduced this year shall prove to be much more effective, and should see more coaches taking a punt on a rookie POD coming straight out of the draft, which I like to see. Thanks, some good points. Let’s hope the coaches play them early and stick with them and we can get some Heppell-like debut seasons! Another thing to remember is that now Sam has done the research you can tuck the info away and dust it off later when the player does crack a game. This is particularly advantageous for players in leagues where stats are difficult to access (SANFL, NEAFL). I only started doing rookie research properly a couple of preseasons ago – tracking the draft, tracking player development, but already I have a database of potentially high(ish) scoring rookies that most DT coaches probably know nothing about. Given the importance of rookies in fantasy footy, knowing something about these players and what they might be able to produce at senior level is an advantage and it means I don’t have to rely on someone else’s opinion when picking rookies in my squad. Does anyone know much about Dean Terlich? Is he a fringe player for the Demons, injured or something? Sam you have gone above and beyond. Outstanding work and thankyou for taking the time to answer so many questions. A big thanks to you Bluenosers for your awesome input as well. Not really. It’s hard to judge rucks like this until they prove themselves at AFL level, as in U18 comps ruck roles are shared around a lot more. This means that the ruckmen who rack up the huge tallies of hitouts in the AFL can’t stand out until they are actually at an AFL club. There will prove to be some worthwhile Fantasy rucks coming out of this crop however I’d avoid picking any this year as, yes, they do ‘take time to develop’. Look at guys like Gorringe and West for ruck bench options. Terrific write up, thanks a lot. How About Paul Ahern drafted at 7 last yeast & is a fwd/ctr? I considered him, but Ahern is not really a Fantasy type, despite having the ability to produce some big scores every now and then. He isn’t a massive ball winner and contributes more to a team in efficiency terms and all-round athleticism than his work on the ball. He’s cheaply priced but you won’t get the same output from him as someone like Gresham or Keays. Great write up and read Gollo, found this extremely helpful in helping choosing my rooks, appreciate it, midfield rooks are solid as, Kennedy, Gresham, Menegola, Phillips, Keays are who I will be keeping an eye on.